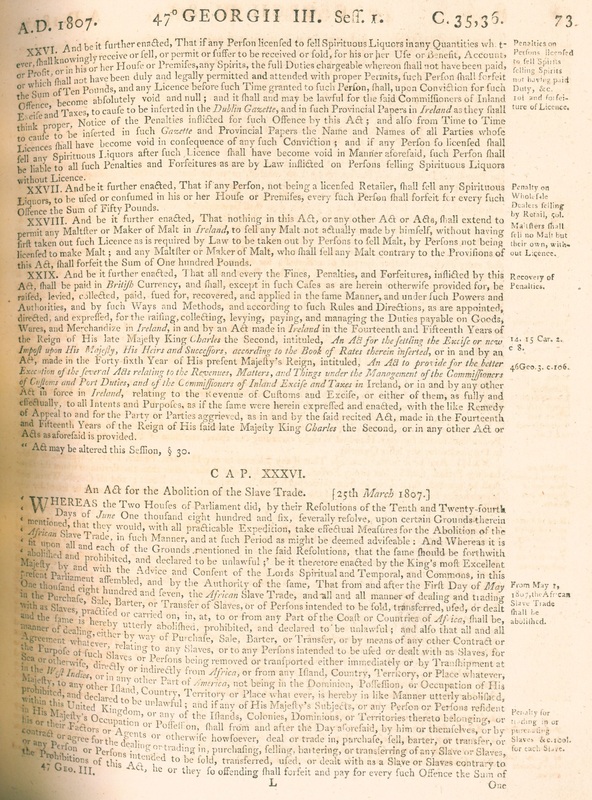 The Slave Trade Act of 1807 prohibited British ships from engaging in “the African slave trade, and all manner of dealing and trading in the Purchase, Sale, Barter, or Transfer of Slaves, or of Persons intended to be sold, transferred, used, or dealt with as Slaves, practiced or carried on, in, at, to or from any Part of the Coast or Countries of Africa.” This effectively abolished the British slave trade and created the mechanisms necessary to enforce this ban, establishing exorbitant fines for ship captains illegally transporting slaves. It also encouraged the British Parliament to start a campaign to suppress the entire African slave trade. 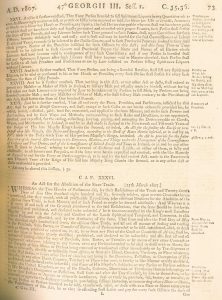 “An Act for the Abolition of the Slave Trade,” in Great Britain, The Statutes of the United Kingdom of Great Britain and Ireland (London: Printed by G. Eyre and A. Strahan), 73-77. Image courtesy of University of Missouri Law Library, Rare Book Room.